If you’ve ever been frustrated with your pace, or tired of things taking so long, or generally feeling like you’re fighting time when you’re hiking, try these five hacks to change your relationship with time on the trail. 2. Avoid checking the time at night. Over the years of sleeping out at night, I’ve learned that no good can come from checking what time it is when it’s dark once you’ve officially gone to bed. If you go to sleep easily and then wake up feeling all refreshed and check the time and it’s only 11:30 p.m., you feel ridiculous and like you are about to experience the night that never ends. If you’re having trouble sleeping and then you check and it’s 4:00 a.m., you’re frustrated because you felt like you didn’t sleep well and now you’re going to have to wake up soon. No matter what, checking the time at night engages the thinking part of your brain, and that can also mean engaging the worrying part of your brain. If you wake up and it’s still dark out, just roll over. Tell stories to yourself. Toward the end of my thru, if I woke up and couldn’t sleep, I would recollect my whole hike. I would start on day one and remember every place I camped until I would fall asleep again peacefully, with no worries about what time it actually was. 3. Try clock-free days. This is harder to do now that most of us are using our phones for so many things, as they tell us the time whether we want them to or not, but If you can, try freeing yourself from time completely. If you’re in the woods with no plans to go into town, try acclimatizing yourself to the rhythms of nature. Eat when you feel hungry. Take a break when you feel tired. You’ll have plenty of warning about when it will get dark and plenty of time to decide where to camp. Trust that you can simply hike in the woods without constantly checking the time to calculate your mph or decide when you’re hungry and when you deserve a break. 4. If you are going to check the time, estimate first. You’ll be surprised at how good you get at knowing what time it is without actually looking. See how close you are. You’ll learn to know what time it is simply by the quality of light, or by your own internal clock that knows so much more than you might give it credit for when you’re surrounded by technology that thinks for you. 5. Use time to motivate you. When you’re having a tough day on the trail and you come to an obstacle – a mountain say, or a big rock cliff, stop for a moment. Try timing yourself to see how long it actually takes to traverse. Your mind will make an estimate somewhere along the lines of “forever”. In reality, it might take you just 30 minutes (or sometimes longer – it took me 3 hours to come down The Priest in Virginia – I thought that down hill would never ever ever end!) No matter how long it takes, note that it was a finite amount of time. It was not “forever”. How would you have spent that time in the “real world”? Would you have frittered it away scrolling through your phone or watching mindless TV? Instead, you just spent that 30 minutes or an hour or two or three being a badass, climbing a crazy-challenging mountain or crossing a muddy rocky expanse of trail. 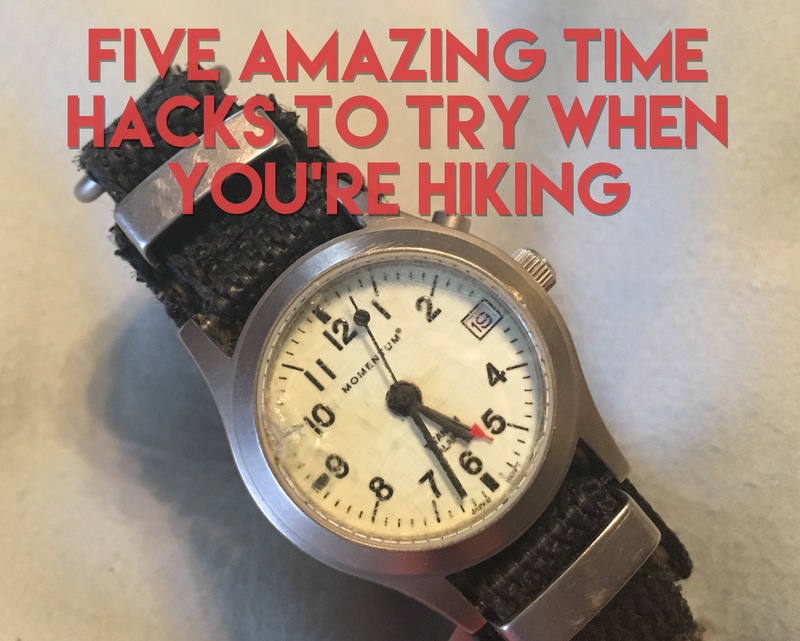 Whether you change the time on your clock, use your watch as a motivator, or simply abandon looking at the time altogether, have fun playing with all the ways you can put time on your side when you’re hiking. Have other time hacks you’ve used and loved? Share them in the comments! Thank you for the tips! I’ve been doing #4 already, but I’ll try the other ideas, too. Great! So glad these ideas are inspiring you!